We've been raving about SPARK at Adventure Stage on social media since opening day. We gave away 4 tickets to a lucky reader & we've had a sidebar link up with details to the show. Click here for our past coverage and full show details. If by chance you've been living in a cave and still haven't seen it, what are you waiting for? Go already! If you have been living underground you'll particularly be able to relate to this production. Highly recommended. We're very excited they are calling this chapter one, since that hints at more to come! 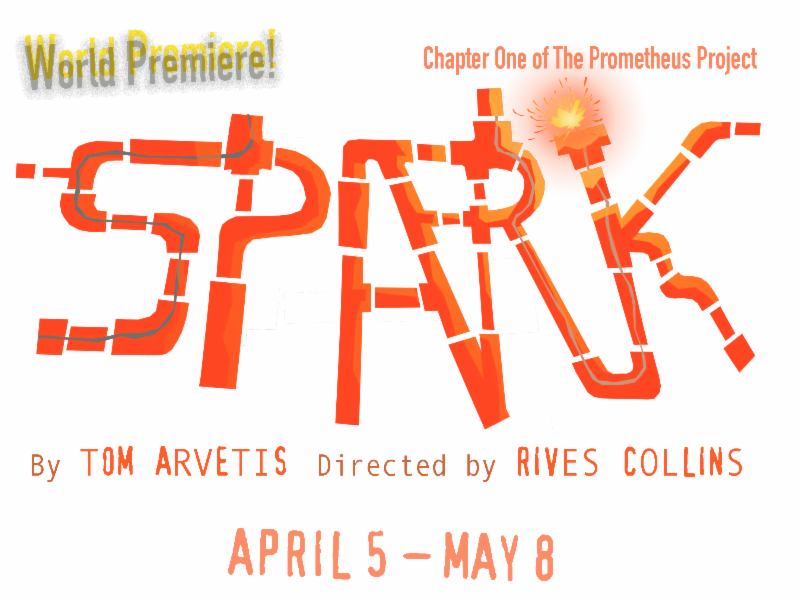 Tom Arvetis has really outdone himself with the world premiere of SPARK. We're also consistently impressed with Adventure Stage's commitment to the community via their home space at The Northwestern Settlement House. They live their mission statement of being there for their neighbors, with free and reduced tickets for the neighborhood, outreach programs and collaborations. My 10 year old daughter's Girl Scout trip partnered up with The Settlement House's program for the elderly, The Golden Agers. The girls made baked goods for the group and escorted them all to and from SPARK, then joined them for lunch. It was an incredible experience for young and old alike! Pandora lives a regimented life within the underground tunnels of Sanctuary, a secluded community designed to outlast the raging violence outside its walls. Each inhabitant of Sanctuary has a purpose, a place, and a common enemy—the mysterious Outliers who live in the world above. But after Pandora personally encounters two young Outliers, she starts to question all that has been taught to her. Is Sanctuary the safe haven she has always believed it to be, or a prison built on fear? As sides are chosen and truths shattered, Pan must ultimately decide between the life she knows and the one that is calling to her. Using projections designed by Liviu Pasare to simulate the texting and gaming that is ever-present in Sanctuary’s techno-savvy world, this inventive adventure set in the near future is recommended for ages 9 (grade 4) and up. The Prometheus Project began when playwright Tom Arvetis and director Rives Collins visited several Chicago middle school classrooms and conducted a series of story circles with Adventure Stage’s West Town neighbors, utilizing the Greek myth of Prometheus as a starting point for understanding contemporary challenges within our community. Themes of power, violence, sacrifice and hope emerged as young people and families shared the daily struggles they experience. 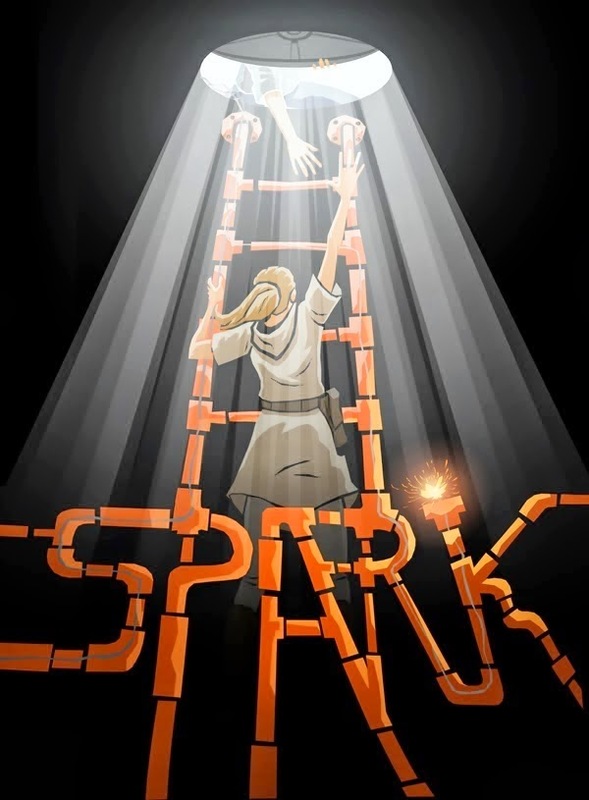 Out of these story circles, SPARK was born. Relying heavily on the archetypes of the Hero’s Journey, ASC's goal with SPARK is to ask our audience to think critically about the responsibility we have to our neighbors and the courage it will take to move our communities toward a more imaginative, healthy and tolerant status quo. Check out our performance schedule, press release, cast and crew, and special events sections for more information! TICKETS ON SALE NOW! Click here for more information. the myths of Prometheus and Pandora.